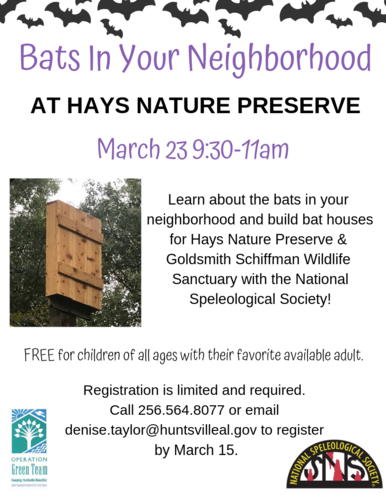 Learn about the bats in your neighborhood and build bat houses for Hays Nature Preserve & Goldsmith Schiffman Wildlife Sanctuary with the National Speleological Society! FREE for children of all ages with their favorite available adult. Registration is limited and required. Call 256.564.8077 or email denise.taylor@huntsvilleal.gov to register by March 15.